IS M-FLEX A GOOD BRAND OF CHIMNEY LINER? YES. 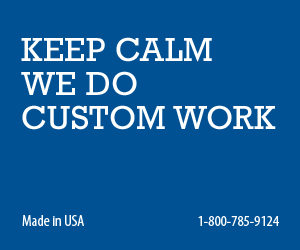 M-Flex has been manufactured in the USA for more than 20 years. It is the top choice for chimney professionals and the hearth industry. M-Flex is made of high-grade 316L/Ti Stainless Steel and formed with a 7 ply locking seam and 10 corrugations between seams which is the industries leading technology. All components that come with your M-Flex Stainless Steel Chimney Liner Kit are also made in the USA by the same manufacturer to ensure the highest quality and a perfect fit every time. IS THE M-FLEX STAINLESS STEEL CHIMNEY LINER SYSTEM STILL WARRANTED IF I INSTALL IT MYSELF? YES. Contrary to popular belief the M-Flex LIFETIME Transferable Warranty does not require the product to be installed by a Chimney Professional. It only requires that the system be properly maintained and inspected annually. IS THE M-FLEX STAINLESS STEEL CHIMNEY LINER SYSTEM UL LISTED? Yes. M-Flex is UL listed to UL1777. Don’t be fooled by other companies that sell a private labeled chimney liner system. Often times the liner system is not UL listed once you change the brand name and if the company is mixing and matching components made by different manufacturers that also can void the UL listing. The M-Flex Chimney Liner system is one of the first Chimney Liner Systems in the industry to be UL listed and all components provided in the M-Flex Chimney liner Kits are manufactured by the same company. If you have a masonry chimney that is lined with terracotta flue tiles, you may find that even though the exterior of the chimney looks to be in good condition you may have damage to the interior flue tiles. If you have cracks or damaged flue tiles it is a good idea to reline the chimney with a Stainless Steel Chimney Liner. This can save lots of time and money over rebuilding the chimney. If you are installing a wood stove or a fireplace insert you should line your chimney with the proper size liner to fit your appliance. A undersized or oversized chimney liner could prevent the appliance from drafting properly, resulting in excess creosote buildup or even smoke and flue gasses entering the living spaces. WHAT KIND OF CHIMNEY LINER DO I NEED? If you need to reline a masonry fireplace that is intended to burn solid fuels (wood) you will need to reline with a high quality M-Flex Stainless Steel Chimney Liner sized to vent your fireplace properly. If you are venting Gas logs or a Gas insert you will still want to use a high quality M-Flex Stainless Steel chimney liner. Most Gas logs and inserts require a liner suitable for venting solid fuels. If you are venting a Gas appliance such as a Gas furnace or Hot Water Heater that is less than 84% efficient, you may use an M-Flex Aluminum Chimney Liner sized properly to vent the appliance efficiently. If you are venting a Gas Appliance that is over 83% efficient you will want to use a M-Flex Stainless Steel Chimney Liner. WHAT SIZE CHIMNEY LINER DO I NEED? For all appliances such as furnaces, Hot Water Heaters, Wood Stoves, and Fireplace Inserts you will want to choose a Chimney Liner that is the same size as the outlet or venting collar on the appliance. Example: if you have a Fireplace Insert that has a 6” collar or opening where the venting is connected you will want to purchase a 6” diameter chimney liner. For venting multiple appliances in a single flue you will want to consult your local and national Code for the fuel you are venting ( NFPA-211 or NFPA-54). For Example if you are venting a Gas burning furnace and a Gas Burning Hot Water Heater you typically can vent both of these through the same flue, however you will need a larger flue liner to vent both properly. You would want to look into the NFPA-54 which is the National Code book for Gas fueled appliances. To find out the length of Chimney Liner that is needed to vent your appliance or fireplace simply measure from the very top of the chimney down to where the liner will be connecting to the appliance. If you are lining a masonry fireplace you will want to measure to top of the firebox or where the flue enters the fireplace cavity. It is always a good idea to order a few extra feet to make the instillation easier. You can always trim off the extra length at the top of the chimney once properly installed. WHICH M-FLEX CHIMNEY LINER COMPONENTS DO I NEED TO PURCHASE WITH MY CHIMNEY LINER KIT? The M-Flex Chimney Liner Components that you will need depend on what kind of appliance or fireplace you are venting. For most Furnace, Hot Water Heater and Wood Stove instillations you would need a Stainless Steel 2 Part Flex Tee and a Stainless Steel Chimney Liner End Cap to terminate the bottom of the tee. These components can be purchased seperatly or included in the M-Flex Stainless Steel Chimney Liner Standard Kit to save money. If you are attaching your M-Flex Chimney liner to a Fireplace Insert you will need to purchase a Stainless Steel Chimney Liner Stove Adapter, which can also be purchased separately or included in the M-Flex Stainless Steel Chimney Liner Basic Kit. You may also want to purchase a Stainless Steel Chimney Liner Elbow to make the connection to the insert easier. You will then need a Stainless Steel Chimney Liner Top Kit which includes both the EZ connect top plate and the chimney cap. 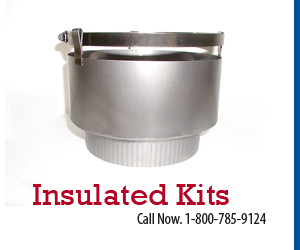 This Item is included with either M-Flex Stainless Steel Chimney liner Kit. SHOULD I INSULATE MY M-FLEX STAINLESS STEEL CHIMNEY LINER? Yes. 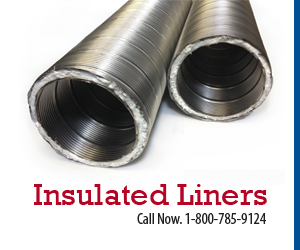 It is always best to insulate your M-Flex Stainless Steel Chimney Liner. This will help prevent excess condensation resulting in excessive creosote build up. Excessive creosote build up can ignite and cause a Chimney Fire. Many houses are lost every year from fires that started in the chimney. All M-Flex Chimney Liners are UL Listed and tested with insulation. You can insulate you M-Flex Stainless Steel Chimney Liner using either the Chimney Insulation Kit or the Chimney Insulation Mix. HOW DO I PREPARE MY CHIMNEY FOR A M-FLEX STAINLESS STEEL CHIMNEY LINER? Make sure your chimney has been cleaned and is clear of any creosote or loose debris. Inspect the interior flue for any damage that needs to be fixed or removed prior to installing your M-Flex Stainless Steel Chimney Liner. HOW DO I PREPARE MY M-FLEX CHIMNEY LINER FOR INSTALLATION? Make sure you thoroughly read and understand the installation instructions that come with your M-Flex Chimney Liner. Uncoil and Straiten the liner as best you can. Connect the 2 Part Flex Tee body only or Stove Adapter to the bottom end of the liner. You will want to have the top plate or Top Kit close at hand to support the chimney liner once it has been installed. Unroll your Chimney liner Insulation if you are using the Chimney Liner Insulation Kit. Spray the Liner and the Wool side of the Insulation Blanket with the spray adhesive supplied in your kit. Wrap the blanket around the liner and seal any seams with the foil tape supplied in the kit. Unroll the wire mesh sock also supplied in the kit and slide the liner through the center. Attach the hose clamps to either end of the liner and in the middle to keep the Mesh in place. This mesh helps to prevent snags and tearing of the Insulation blanket during the installation. You are now ready to start feeding the liner into the flue from the top. It is helpful to have an extra set of hands both inside where the liner will be connected and at the top of the chimney to assist you in your installation. HOW DO I CONNECT MY M-FLEX CHIMNEY LINER TO MY APPLIANCE? If you are connecting your Chimney Liner to a wood burning appliance you will want to make sure that all connections are made with the male end toward the stove or appliance. This way any loose creosote will drain back into the stove or appliance. Make sure all connections are tightly secured using the EZ clamps attached to the components or with Stainless Steel screws or rivets. HOW DO I TERMINATE MY M-FLEX CHIMNEY LINER AT THE TOP OF THE CHIMNEY? Once the liner is positioned properly to make the connection at the appliance. Slide your top plate over the top of the liner and clamp it in place. If you have a Top Kit you will want to detach the Rain Cap from the top plate, this will be reattached later. Once your liner is secured properly using either the EZ clamp connection or a Stainless Steel Chimney Liner Top Clamp you will want to make your connection to the appliance. Now you will need to trim the excess liner off at the top leaving a few inches to accommodate for the Rain Cap. Attach your Rain Cap using the EZ clamp. HOW DO I MAINTAIN MY M-FLEX CHIMNEY LINER? Now that you have a M-Flex Chimney Liner installed you are ready to use your appliance or Fireplace. You will want to make sure you have your chimney cleaned every year using the proper cleaning practices and products. Your local Chimney Professional or sweep will know what is best to use. This will help prevent Chimney Fires and other possible complications due to excess creosote build up. WHAT TYPE OF FASTENERS SHOULD I USE TO INSTALL MY PREMIER RIGID OR M-FLEX CHIMNEY LINER? Your M-Flex Stainless Steel Chimney Liner Kit comes with components that have an EZ connection. This is the best way to attach components and support the liner. Your Premier Rigid liner system will require either Stainless Steel self tapping screws ½” long or Stainless Steel Rivets to join each section. HOW CAN I AVOID CHIMNEY FIRES? The best way to avoid Chimney Fires is to use proper burning practices and have your chimney cleaned and inspected at least once a year. Proper burning practices consist of burning small HOT fires using well seasoned Firewood. Never burn Green wood, Plastics or Trash in your fireplace or wood stove. HOW OFTEN SHOULD I HAVE MY M-FLEX CHIMNEY LINER CLEANED? You need to have your M-Flex Stainless Steel Chimney Liner cleaned and inspected annually to uphold the warranty. However if you burn a large amount of wood each season you may think about having it cleaned half way through the burn season. WHAT IS THE BENEFIT OF INSTALLING A M-FLEX STAINLESS STEEL CHIMNEY LINER OVER REPLACING MY CLAY FLUE TILES? The M-Flex Stainless Steel Chimney Liner is a less expensive alternative to replacing your Clay flue tiles and has many benefits. Your M-Flex Stainless Steel Chimney Liner comes with a LIFETIME transferable WARRANTY! Clay flue tiles are a masonry product that cannot be warranted and can crack and become lodged in your chimney if you have an unexpected flue fire. The M-Flex Stainless Steel Chimney Liner is designed to contain and unexpected flue fire protecting your home from possible further damages. SHOULD I BUY THE PREMIER RIGID LINING SYSTEM OR THE M-FLEX FLEXIBLE STAINLESS STEEL CHIMNEY LINER SYSTEM? These are both great Stainless Steel Chimney Liner Systems. We recommend that if you have a short chimney 15’ or less and it is strait with no offsets the Premier Rigid Liner is a great choice. At 24ga the steel is thicker and has a smooth interior for the best draft and flow of flue gasses and creosote. The M-Flex Stainless Steel Chimney Liner Kit is always a great choice. It works for all applications and is much easier to install. If you have a taller chimney with offsets this is by far the best choice for you. HOW CAN I PROTECT THE BRICK/MASONRY ON THE OUTSIDE OF MY CHIMNEY? It is very important to protect the masonry products on the exterior of you chimney as well. Brick and mortar can deteriorate from years of weather and water infiltration and even the cement crown on top of the chimney can crack and deteriorate. You can protect these surfaces by Water Proofing them with the Saver Systems Chimney Saver, Saver Systems Crown Coat and Saver Systems Flash Seal. A chimney cap is very important to ensure the lifespan of your chimney. A chimney cap will prevent water infiltration from prematurely damaging you inner flue. It will also keep rodents and birds from making a home in your chimney. WHY WOULD I NEED TO REPLACE MY FLUE LINER? Clay Flue Tiles and even galvanized piping will deteriorate over time. If your Clay Flue Tiles are cracked or the mortar joints are missing or deteriorated then you need to replace the liner for safety purposes. Creosote and harmful flue gasses can leak through these cracks and mortar joints. Installing a M-Flex Stainless Steel Chimney Liner will give you a continuous flue that will not leak any flue gasses and creosote and caries a LIFETIME TRANSFERABLE WARRANTY.